These wall hooks offer the perfect place to hang your coats and jackets. Delightfully quaint boho style, ideal for hanging in the hallway or cloakroom. Four double hooks mounted on a woodn plaque that is decorated prettily with a boho style print. Ideal for hanging in the hallway or cloakroom and can also be used in the bathroom or kitchen for bath towels, tea towels, aprons and oven gloves. These wall hooks offer the perfect place to hang your coats and jackets. Delightfully quaint boho style, ideal for hanging in the hallway or cloakroom. 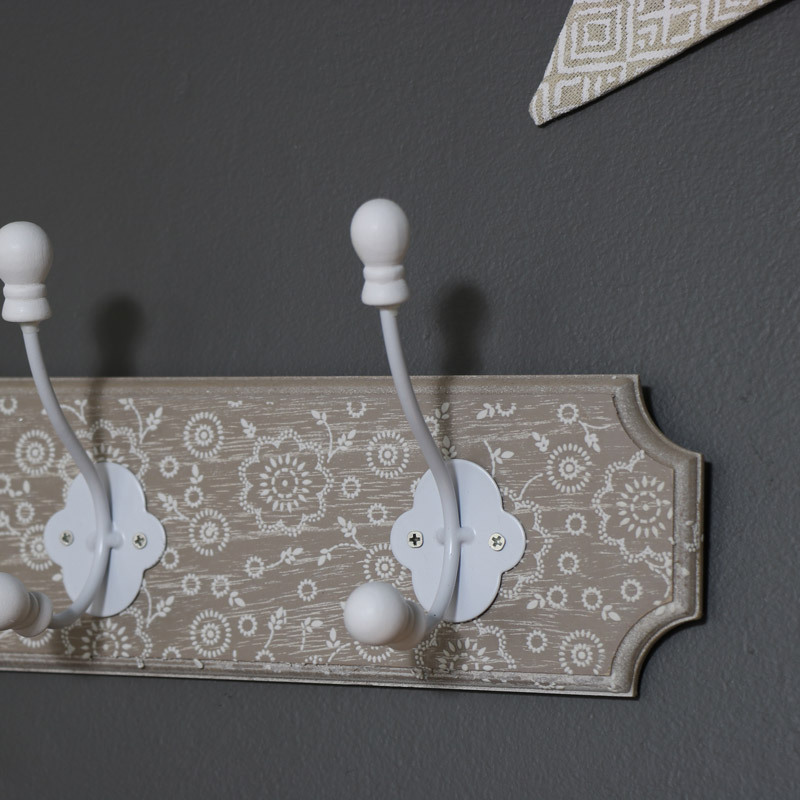 Four double hooks mounted on a woodn plaque that is decorated prettily with a boho style print. Ideal for hanging in the hallway or cloakroom and can also be used in the bathroom or kitchen for bath towels, tea towels, aprons and oven gloves. Four white metal hooks in a double hook style, mounted on a wooden plaque/plinth. 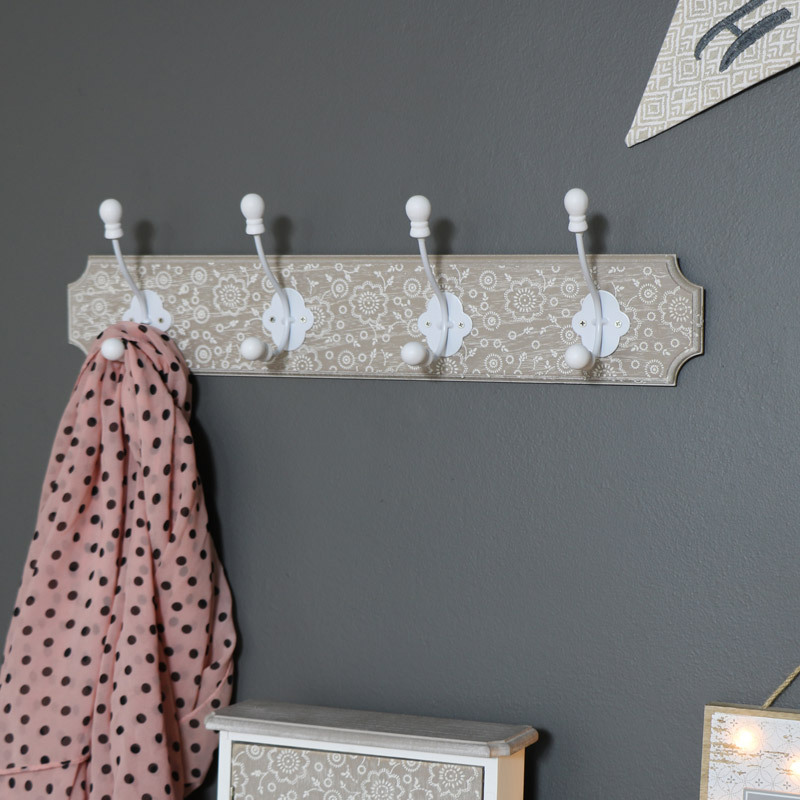 Easily wall mounted with 2 hooks on the back. With a wide range of hooks and racks to choose from, you'll never lose your keys or struggle to find a place to hang your coat again, in a choice of sizes, styles, colours and designs.